Technology innovation is America’s specialty. It’s what maintains our international leadership and competitive edge and what will ensure our nation’s future success. Half of all economic growth in the U.S. since WWII can be linked to technological innovation.1 Energy technology is one of the largest areas of U.S. innovation. Energy research and development (R&D) conducted by national laboratories, universities and businesses has allowed the U.S. to develop such varied technologies such as unconventional gas extraction, highly-efficient engines, lithium ion batteries, natural gas turbines, solar technology and nuclear power. In addition to inventing entirely new methods of utilizing and controlling energy, R&D allows us to continue to make energy cheaper and more reliable for consumers, while giving American businesses an advantage. The U.S. invests heavily in basic research in all technical fields of study for the public good – including physics, mathematics, biology and health. But the government also invests in much later stage technology in some areas of R&D, such as in energy and space. The reason the U.S. government has played such a large role in energy in particular is that R&D is most warranted in areas where the private sector is underinvesting. While industries such as pharmaceuticals and computing have a clear short-term interest in significantly improving their products, innovation in industries like energy has high capital cost, a very long timeline for impact and doesn’t always result in return for companies (environmental and other improvements).  As a result, energy companies invest much less on R&D than other technology-focused fields (see below). For this reason there is a role for government to support energy R&D, as long as there is a clear need unfilled by the private sector and investments in R&D can be swiftly transferred to benefit Americans. The United States first began investing heavily in energy R&D following the conclusion of World War II in order to utilize nuclear fission for peaceful purposes. Energy R&D greatly increased in the mid-1970s in response to the global oil crisis. 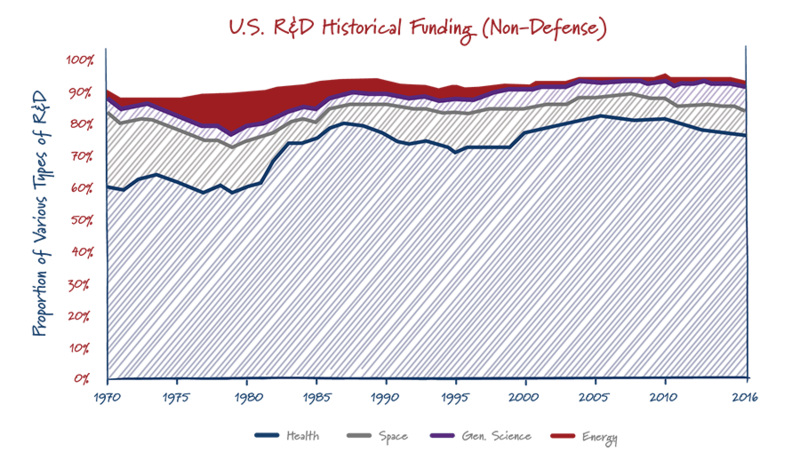 However, energy’s profile in total U.S. R&D since the 1970s has greatly decreased from its peak of 12% to its current level of just below 2%. 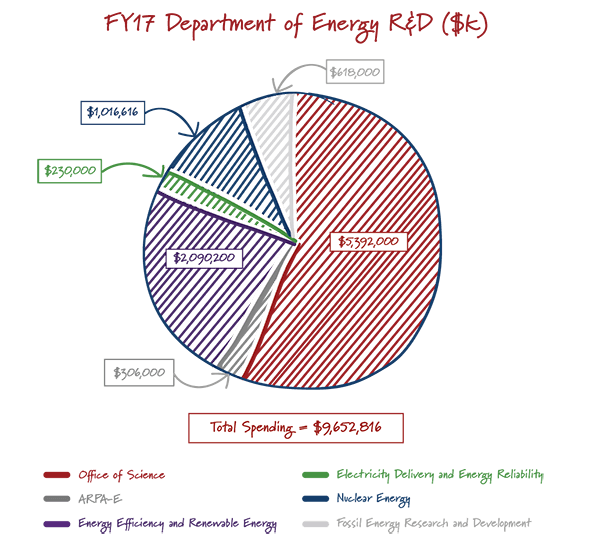 Where does our science and energy R&D funding go? The Department of Energy sponsors a wide variety of research, including at universities and private companies. The DOE primarily funds research at the nation’s 17 national labs but a large portion of its funding is ultimately given as grants to research institutions across the country. Basic Science: A majority of the Department of Energy’s non-defense R&D supports the Office of Science. This work examines the fundamental nature of matter and physics, but also supports crucial supercomputing research and basic research into biology and genetics. The Office of Science operates large scientific-user facilities, including high-energy microscopes and light sources that would be prohibitively expensive for universities or companies to operate.  Efficiency and Renewables: The second largest funding goes the Office of Energy Efficiency and Renewable Energy, known as EERE. EERE has a broad mandate and supports the DOE’s research into renewables, including solar, wind, water and geothermal energy, as well as vehicles and a wide portfolio of energy-efficient materials and manufacturing techniques. Nuclear: Roughly $1 Billion goes to the Office of Nuclear Energy (NE) each year, of which roughly half is used for R&D. The other half is used to maintain laboratory infrastructure and security. NE conducts research on advanced nuclear reactors, including examining which fuel forms, materials and designs are most commercially viable. Carbon Capture and Fossils: The Office of Fossil Energy (FE) largely conducts research into reducing the environmental impact of fossil energy technologies by developing efficiency and carbon capture technologies. Much of the budget is used to support large-scale pilots of carbon capture technologies, as well as the National Carbon Capture Center in Birmingham, Ala.
ARPAE: The Advanced Research Projects Agency – Energy (ARPA-E) investigates cutting-edge energy technologies. ARPA-E applies private sector-style project management to innovative experiments, such as attempts to replace oil with plants and discover low-cost fusion technology. Grid Modernization: The office of Electricity Delivery and Energy Reliability (OE) researches the electricity grid technologies of tomorrow. OE works on cybersecurity, transmission technologies, grid-scale energy storage and smart-grid technologies.